PLEASE COMMENT: Leadership – What Does It Mean To You? I’m working on a presentation about leading the next generation. And I want to get your inputs for this presentation. Think of a leader that you have known in your life. This leader can be a boss, someone at your school, someone you know, a president, a great speaker, someone from history…. basically anyone that you have witnessed as a great leader. Now, think of what made them a great leader. What were the 1-2 things that they did that stood out to you that made them great? How did they interact with their followers? How did they tell their stories and talk to the people? I have just one request – please share your thoughts as comments to this blog. I’d like to take your input and build it into my presentation as inputs from the community. Thanks in advance for your inputs and comments! Author Mike LylesPosted on September 6, 2015 September 6, 2015 Categories Leadership & ManagementTags boss, community, follower, history, leaders, Leadership, manager, people, politician, presentation, president, stories10 Comments on PLEASE COMMENT: Leadership – What Does It Mean To You? I’m now published in CIO Magazine! It gives me great joy and pride to announce that my interview with Jeffrey Fox has been published with CIO Magazine. I hope that you, my loyal followers and readers, will check out this article and enjoy it as much as I enjoyed writing it!! 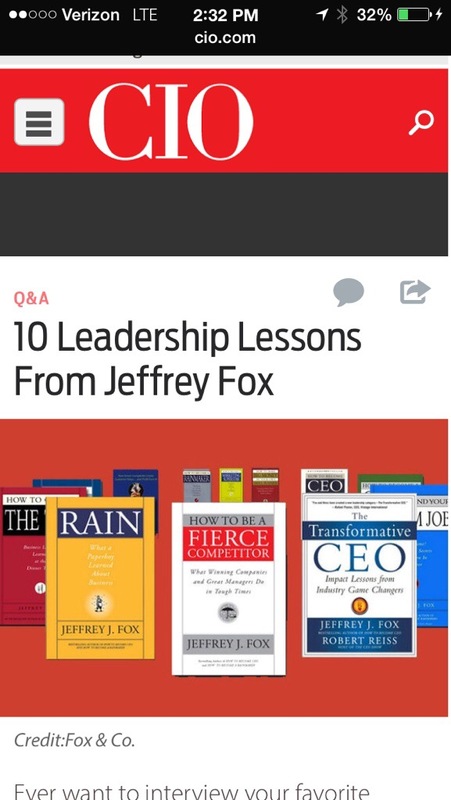 Author Mike LylesPosted on July 10, 2014 July 10, 2014 Categories Leadership & ManagementTags article, boss, cio, cio magazine, interview, jeffrey fox, jeffrey j. fox, Leadership, magazine, manager, mike lyles2 Comments on I’m now published in CIO Magazine! Are You Smarter Than a Test Manager? Does this title make you sing the theme to the popular TV game show “Are you smarter than a 5th grader?” It probably does. I wanted to inform all my readers that I have been selected to teach a course at the next Software Test Professionals conference (STPCon which is in Phoenix, Arizona in October). My goal with this specific course is to pull together a room full of professionals in the testing world which will discuss the common areas where organizations are not in alignment. Driving change and understanding will always revolve around first making sure the team driving that change is aligned. Therefore, we will have a very productive and interactive session, and collaborate our thoughts, documents, and results so that everyone can take these ideas back to their respective teams and build creative and innovative solutions to the problems we face today. Thanks to all of my supporters and blog followers! Stay tuned for more to come! Author Mike LylesPosted on July 9, 2013 Categories Quality Assurance & TestingTags alignment, are you smarter than a 5th grader, arizona, best practices, conference, game show, manager, phoenix, smarter, STP, test, test manager, testing2 Comments on Are You Smarter Than a Test Manager? If you’re in the testing profession, especially if you’re a Test Manager, I am reaching out to everyone to get input for a survey that I have created to pull information related to Test Managers and the profession. I am using this information to review within a presentation that I am preparing for the Software Test Professionals conference in San Diego, CA (STPCon) April 22-25, 2013. Please go to the following link and take the survey – the questions are very simple and should only take a few mins to go through and respond. Also, please share the link with all that you know that could submit responses as well. Here’s the link! What do YOU know about Test Managers? Calling all testing professionals, practitioners, and enthusiasts! I’m working on the material for my STPCon presentation “A Day In The Life of a Test Manager” in San Diego (April 22-25,2013) and I’m soliciting your inputs on specific areas you would like to discuss in the course. As I wrap up my own plans and ideas, I’d like to pull in specific input from this forum to add additional material to the presentation. Test Managers: the world is full of them. But do we really know what they do? Does your organization agree on the core roles and responsibilities? The answer is probably “No” for many organizations. This session will examine the day-to-day life of past and present test managers, case studies on their practices, review results of a survey taken among various test managers, and suggestions on which responsibilities need to be core in a successful quality organization. I plan to have topics regarding Test Managers and Test management that are common among all organizations as debate items – specific discussions where half the room may feel one way and the other half feel another way. How would you describe the roles, responsibilities of a Test Manager? What are the skill sets that successful future Test Managers should possess? What are the challenges of the Test Manager Role in your view? Does the role vary a lot across industry or the core of the role remains same always? How important is People Management as a skill required for a Test Manager role? What weightage (%) would you give it in the role for a TM. Which are the major conflict zones in a testing organization , internally within themselves and externally with the other teams – PMO, Development , SCM, Release Management team, Maintenance team , Environment teams . I appreciate any inputs you have or areas where, if you were an attendee to a conference presentation of this title, would want to see discussed. Thanks in advance for your inputs and help!! Please add your ideas, notes, suggestions, questions, comical remarks, or just simply your support as comments below!!! NOTE: Come back in a few days – I will be posting a survey for which I will be putting together questions that both I (and each of YOU!!) have put together, for a survey on Test Managers, which will be used to share the results with conference attendees! Author Mike LylesPosted on March 2, 2013 Categories Quality Assurance & TestingTags a day in the life, conference, manager, STP, STPCon, survey, test, test manager, testing8 Comments on What do YOU know about Test Managers?